A dental crown is a restorative procedure used to strengthen a tooth when broken or improve its shape and appearance. 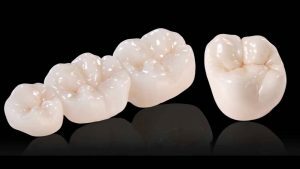 Our patients use crown for teeth that are broken, worn, or have portions affected by tooth decay. A crown, also known as a “cap,” is cemented onto an existing tooth with cement and usually covers the portion of your tooth above the gum line. Crowns can be made of porcelain, metal, or both. Porcelain crowns are most often preferred because they mimic the look and feel of natural teeth. A crown is fabricated away from your mouth by a dental laboratory. Your crown is created in the lab from your unique tooth impression, which allows a dental laboratory technician to examine all aspects of your bite and jaw movements, and which we create at Skyline Dental. Your crown is then sculpted just for you so that your bite and jaw movements function normally once the crown is placed. Do you need a crown or are unsure if you do? Contact us and we’ll schedule an appointment to evaluate your options.